Indonesia’s Transport Ministry has ordered an inspection of all Boeing 737 MAX 8 planes in the country after a Lion Air plane plunged into the sea off Jakarta this week. Experts from Boeing are expected to arrive in Jakarta today to help determine why the plane crashed about 15 kilometres off the coast on Monday, killing all 189 people on board, Indonesia’s National Transportation Safety Committee said. Relatives numbed by grief have provided samples for DNA tests to help identify victims, as accounts emerged of problems on the jet’s previous flight including rapid descents that left travellers vomiting “like in a roller coaster”. Hundreds of rescue personnel searched seas where the plane crashed, sending more than three dozen body bags to identification experts, while the airline flew dozens of grieving relatives to the country’s capital, Jakarta. 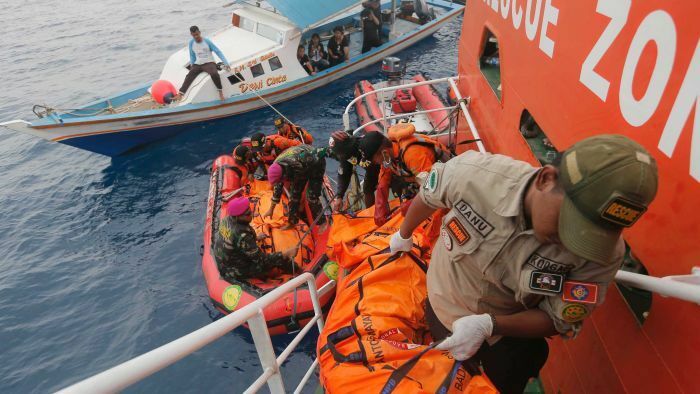 The two-month-old jet plunged into the Java Sea just 13 minutes after taking off from an island off Sumatra. Its pilot requested clearance to return to the airport 2-3 minutes after take-off, indicating a problem, though the cause remains uncertain. The chief of the police’s medical unit, Arthur Tampi, said it has received dozens of body parts for identification and is awaiting results of DNA tests, which were expected to take up to eight days. The disaster has reignited concerns about safety in Indonesia’s fast-growing aviation industry, which was recently removed from European Union and US blacklists. Alon Soetanto told TVOne the plane dropped suddenly several times in the first few minutes of the flight. “About three to eight minutes after it took off, I felt like the plane was losing power and unable to rise. That happened several times during the flight,” he said. His account is consistent with data from flight-tracking sites that show erratic speed, altitude and direction in the minutes after the jet took off. A similar pattern is also seen in data pinged from Monday’s fatal flight. Safety experts cautioned, however, that the data must be checked for accuracy against the plane’s black boxes. Lion Air president Edward Sirait said there were reports of technical problems with the flight from Bali but they had been resolved in accordance with the plane manufacturer’s procedures. The airline did not respond to requests to verify a document purporting to be a Lion Air maintenance report, dated Sunday, that described inaccurate airspeed and altitude readings after take-off. “He just showed me the flight permit that he had signed and he said the problem had been settled,” she said. Previous articleDid you catch this Sandman homage in Chilling Adventures of Sabrina?